David E. Fields, Ph. 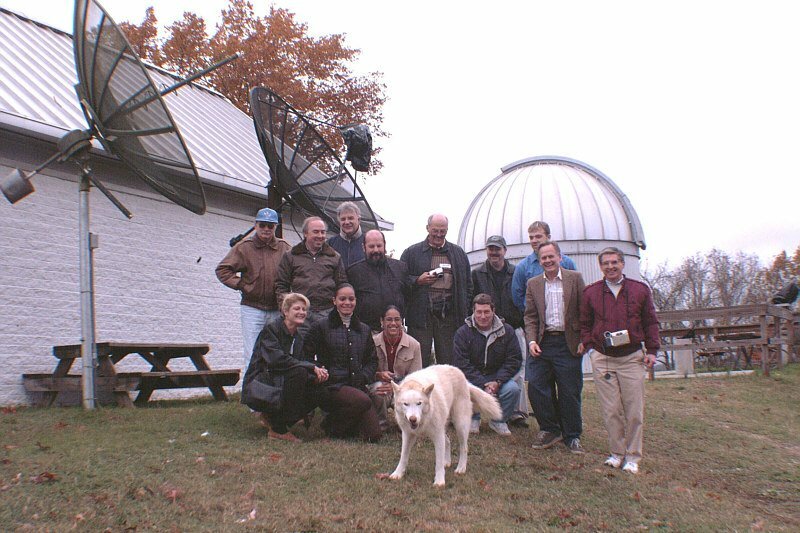 D.
second from the right in this shot taken at their off campus observatory. Click on thumbnail to download full-size picture. nice size ampitheatre style classroom with some excellent AV equipment. also has JOVE/SkyPipe with Internet connectivity from there. lashed to the railing outside. the way the mini-conference came off. So was I. 1030 David Fields, Carl Lyster and Bill Howe, Tamke-Allan Observatory, Roane State Community College and Martin Marietta Corp.
1330-1530 EST TAO will be on-line observing solar emission for this event. Thanks to Chuck Higgins of Middle Tennessee State University for sending Project Jove brochure handouts. Thanks to Dr. Wade McCamey and Dr. Adolf King of Roane State Community College for their encouragement. Thanks to Charles and Janis Osborne for helping contact the SARA members and for planning a visit to PARI.